Preheat the broiler. Toss the cauliflower with the olive oil in a large bowl and season with salt and pepper. Spread out in a single layer on a large baking sheet (set the bowl aside) and broil 4 inches from the heat source, stirring occasionally, for 15 to 17 minutes, or until lightly charred in spots and just tender. 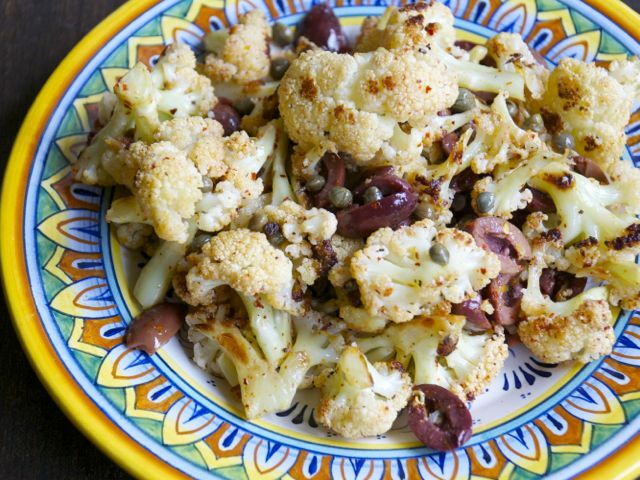 Return the cauliflower to the bowl, add the olives, capers, red pepper flakes, if using, and lemon oil, and toss to mix well. Taste and season with more salt and/or pepper if necessary. Serve, or let stand at room temperature for up to 1 hour to bring out the flavors. The cauliflower can be refrigerated for up to 3 days; bring to room temperature before serving.